While the Switch as a platform is thriving, ARMS is its redheaded stepchild. In its first two weeks, it peaked at the 13th most popular game on the eShop. Despite being a less popular Nintendo exclusive, some competitors are keeping the fighting spirit alive months after most moved on to other games. ARMS is a mix of traditional fighting games with three-dimensional movement, with two fighters locked across from each other like boxers. With two fighters pacing back and forth, flinging out different punches and jabs, it’s a Nintendo take on boxing and feels like a spiritual successor to its early classics like Punch-Out! Commentator Caleb “PineappleFreak” Vahcic tells me that ARMS is easier for new players to learn than many other fighting games. You don’t have to memorize quarter-circle or half-circle inputs. The motions are simple, and it’s what you can do with them that makes ARMS a rich game to play. Like most of the small scenes that dot the competitive video game landscape, the ARMS scene is propped up by its players, who form teams and organize tournaments to keep competition active. Though a few players are sponsored by teams, for the most part it is a community effort; a wrinkle highlighted by news of Joseph “TenTanMan” Mills being let go from his small sponsorship. Evo Japan could be a watershed moment for the game—a reminder to the fighting game community at large that the scene still exists and is a compelling game to watch. “Everybody is hoping that Evo Japan is going to attract more people,” Duhaney tells me. But not all is well ahead of the tournament later this month. It’s the least popular game at Evo: according to organizers, every other game has nearly double the participants registered, or much more. And the top American is flying in on a sour note. In his eyes, though, it was inevitable. Evo Japan is a huge stage. It’s one of the first major tournaments for the new year, and could set the tone for ARMS’ lifespan—Nintendo has confirmed there won’t be any more content updates for the game. Some within the community are looking past Evo, though: What happens after? It hasn’t been easy to keep the passion for the game alive. Nintendo-sponsored tournaments have popped up, but they’ve mostly been in Japan as the ARMS Grand Prix. For other competitions, players have had to organize their own. Don’t Get Hit was put on by the Neopunch crew, and Fight Clubs and other weekly tournaments keep popping up, encouraging newcomers and old fighters alike to keep playing. Most recently, a player who goes by “HanukkahJamboree” organized Smash Out Hunger, an offline tournament in St. Louis with a fair number of top entrants that raised $2,000 for the St. Louis Food Bank. But where games like Street Fighter thrive on offline tournaments, competitive ARMS exists mostly online. Discord, an online messaging chat room app, is where most of the scene assembles nowadays. Members of team Fellows In ARMS help run a channel called the “back room,” where players, commentators, and organizers discuss rules, competition, and how to expand the community. While competition can get tough, top player Corey “(S3)OL” Duhaney sees it as a friendly environment. Players stay invested because ARMS is still a game being solved. As games age, and especially as they lose developer support and patching, a predominant meta-game starts to emerge. While players may occasionally disrupt a years-old status quo, for the most part, a game will be “solved” given enough years. But ARMS is a unique game. It follows a mixture of different styles, and so many players have been constantly uncovering new techniques and approaches. Duhaney tells me it has a high skill ceiling and low skill floor—competitive game jargon that means it’s easy to get in on the ground floor and start competing, but the limit to what players might be able to achieve over time hasn’t been reached yet. Fellows In ARMS captain Dennis “Defur” Bagstevold also says ARMS is a game that isn’t quite as mechanically demanding as other competitive games. You still have to think and react to what your opponent does, but as Bagstevold puts it, you don’t have to do 35 inputs in 0.3 seconds to punish it effectively. For Bagstevold, he enjoys the mind games. The highly tactical aspect makes it a different match every time, even if it’s the same character and loadout. The road ahead for competitive ARMS runs right into Evo Japan 2018, where the game has been accepted as one of the main tournament games. The Japanese scene, as the players tell me, has been thriving locally with the Nintendo-supported Grand Prix and a few local events. Many of the international tournament players around the world, including Duhaney and Bagstevold, plan on flying out to compete for Evo Japan to play. Despite its lack of support for the competitive side, Nintendo has put out a surprising amount of support for ARMS as a game, including updated spectator options and party lobbies and customizable controls. You can even replay old matches and review them, frame-by-frame. But small idiosyncrasies of the Nintendo Switch system still cause problems for those trying to recruit new players, like the inability to message players using Nintendo’s built-in social features. Games like Splatoon or Super Smash Bros. have had similar problems in getting developer support for competitive issues. “I found two names on the European ladder with Swedish-sounding names and there are very few Swedish players,” said Bagstevold, who hails from Sweden. “I really want to get in contact with them, but I can’t. So right now, I’m like, reaching out to all these groups to see if we can you know, beam out the message to these two players.” Bagstevold even mentioned that some ARMS members had (jokingly) suggested trying to trace an IP through the Switch, just to find more high-level Swedish ARMS players. There are talks at the moment for more events, online and offline, in the coming year for ARMS. But as it stands, the competitive ARMS scene is like so many other competitive games that garner small but fervent followings. 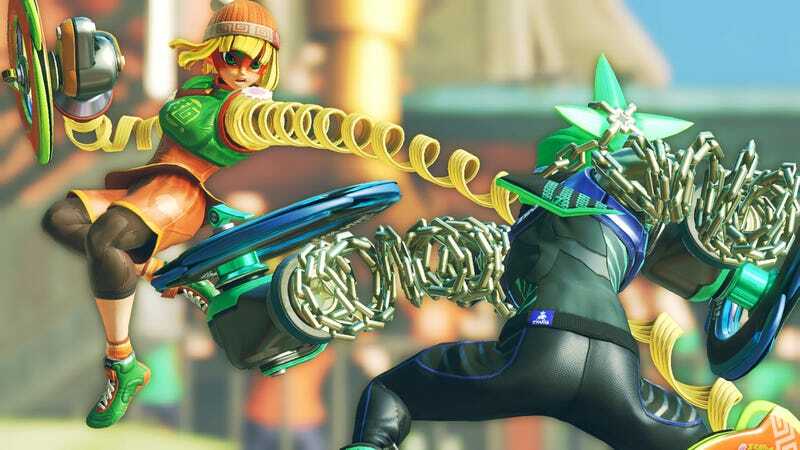 As some games build up franchised leagues and recrui celebrity and sports cash, the ARMS community will forge ahead, looking to whatever might be beyond the horizon of their biggest—and hopefully not last—premier event. An earlier version of this story said that Caleb Vahcic would be going to Evo to play and cast. Dennis Bagstevold will.